Now that I left my job, I’m buying health insurance on the exchange under the Affordable Care Act (ACA). Before ACA, getting health care coverage is one of the biggest challenges for becoming self-employed. Forget about the cost; just getting a policy is a challenge by itself. ACA changed all that. Now self-employed people can buy health insurance on the exchange. Not only are you able to buy health insurance, the coverage is also made affordable by the premium subsidy in the form of a tax credit. 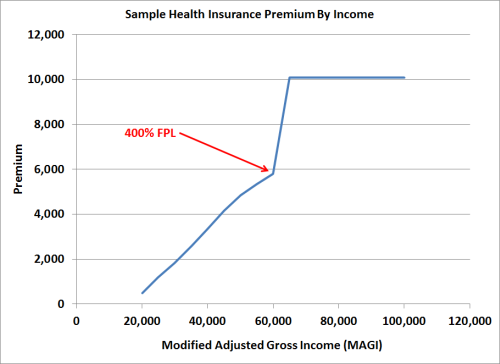 Whether you get the Premium Tax Credit for buying health insurance on the exchange depends on whether your modified adjusted gross income (MAGI) exceeds a critical cutoff point at 400% Federal Poverty Level (FPL). See 2017 2018 2019 Federal Poverty Levels (FPL) For Affordable Care Act for where 400% FPL is at for your household size. Wages, interest, dividends, capital gains, pension, withdrawals from pre-tax traditional 401k and IRAs, money you convert from Traditional to Roth accounts all go into MAGI. Otherwise-not-taxed muni bond interest and Social Security benefits also count in MAGI. 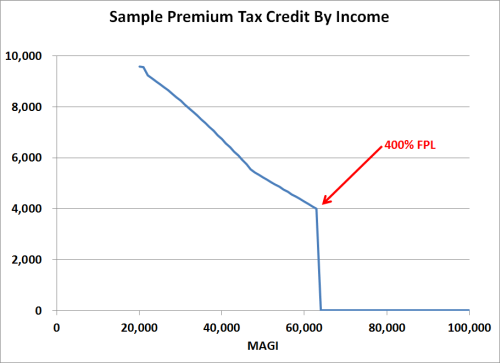 If your MAGI is at 400% FPL or below, you get a tax credit (subsidy) equal to the difference between a percentage of your MAGI and the cost of the second least expensive Silver plan. The tax credit goes down as your income increases. It disappears when your MAGI goes above 400% FPL. If your MAGI is $1 above 400% FPL, you pay the full premium with no tax credit. For my age and household size, it means a difference of more than $4,000 in tax credit. Because the health insurance premium is higher for older folks, so is the tax credit for someone older with the same MAGI. For someone 10 years older than I, that difference becomes more than $10,000. If you can manage it, you definitely want to keep your income under 400% FPL. You see the big jump at income slightly above $60k for a family of two, caused by losing the tax credit once your MAGI goes above 400% FPL. Fortunately it’s relatively easy to stay under the cliff for those who rely on an investment portfolio for income. When you are before 59-1/2, you are primarily spending money from your taxable accounts. A large part of the money withdrawn is your own savings; the rest are interest, dividends, and capital gains. Spending your own savings isn’t income. If you withdraw $60k to live on, your MAGI isn’t $60k. It’s probably less than $30k. When you supplement your income with part-time self-employment, you still have the option to contribute to pre-tax traditional 401k, IRA, and HSA. Those pre-tax contributions lower your MAGI, which helps you stay under the 400% FPL cliff when necessary. This also means that, for those who need to buy health insurance on the ACA exchange, living in an area with low cost of living and low state tax is ever more important than before. Low cost of living and low state tax means you will need less income and a lower out-of-pocket health insurance premium. There is another cliff on the low side, although that one is easily overcome. In order to qualify for premium subsidy for buying health insurance from the exchange, you must have income above 100% FPL. In states that expanded Medicaid to 138% FPL, you must also not qualify for Medicaid, which means you must have MAGI above 138% FPL. If you see your income is at risk of falling below 100% or 138% FPL, just convert some money from Traditional 401k or IRA to Roth. That’ll raise your income. Just remember to do it before December 31. Great writeup! Nice to have a well-thought-out reference. I retired at 52 and did the 72t. Fortunately now that I’m 60 I can decide on how much to withdraw from IRA accounts, because I would have been over the cliff with no means of changing the withdrawal amounts. As you state, I’ll just use taxable savings to supplement my pension for a few years now. You state that money converted from traditional to Roth accounts is part of MAGI. Later you state that spending your own savings is not income. Why isn’t money converted to a Roth (saved money on which taxes were paid) treated the same? Sorry if it wasn’t completely clear. As you are converting pre-tax money from Traditional to Roth, that conversion is taxable, and it is in part of your MAGI in the year you convert. After you already converted, withdrawing from Roth accounts after 59-1/2 isn’t taxable and it’s not part of your MAGI when you withdraw. I was referring to the former, not the latter. What? An Obamacare article that doesn’t blindly bash or praise, but looks rationally on how it might actually affect people. Good work. I agree; health insurance surely has been one of the more daunting challenges for folks who are looking to retire early. Thanks for clarifying how early retirees can use this policy to their (further) advantage. While the information in this post is accurate, it shows just how ridiculous ObamaCare really is. I am self-employed and have paid for my own individual Blue Cross policy for over 10 years now. It is a high deductible plan with a HSA option. I am still in my early 40’s and in very good health, so the premiums have been affordable. And I have fortunately never actually used the insurance in the 10+ years I have had it. With the implementation of ObamaCare next year, my plan is no longer a benefit compliant plan, and the replacement options with Blue Cross will increase my current premiums by about 300%. Therefore, I have looked at the exact scenario Harry outlines above. I can just move to an exchange plan, manipulate my income down to qualify for subsidies, and possibly even pay less than I do now for improved coverage. Do I want to do that? No, I hate the idea of ever being on the government dole as I have never been in my life. But with the government negating my existing policy and artificially increasing my existing premiums thru ObamaCare, the incentive is obviously there. If I choose to do this, it will actually increase the liability of my healthcare cost to other taxpayers. Just as Harry, who pretty clearly could afford his own insurance even at age 55-65, will therefore also shift more of his medical cost onto taxpayers. Wise economically for such individuals, but terrible public policy. I don’t know about that. Health care is very expensive. I tried adding 10 years to my age. The $4,000 tax credit at the edge of the cliff becomes $10,000, and that’s based on today’s prices. As you know medical costs have been going up faster than inflation. I don’t think I will be able to afford it without the credit. I thank the taxpayers for helping me out. I have been helping other taxpayers (and non-payers) with my fair share all these years. Just saw this this morning. Senator Susan Collins of Maine is pushing for means testing of the ObamaCare subsidies as one condition in a plan to reopen the government. Which would make this entire post no longer relevant. Will means testing happen? Probably not this year, but I can’t see how it won’t in pretty short order. Anyone that believes and plans on receiving health care insurance subsidies based on lower income, while still maintaining substantial wealth, is likely to be disappointed. The news report I read says “income means testing” which is already in the ACA, not “assets means testing.” I don’t know what exactly Sen. Collins is proposing. Proposals, however, are a dime a dozen in Washington. We will deal with it when something is passed by both houses and signed into law by the President. It will give opportunity for more blog posts! This is a little off-topic, but… Aside from helping out the early-retired, I think an underappreciated aspect of Obamacare might be its effect on stimulating entrepreneurship. Yes, one could argue that requiring employers of 50 or more to provide health insurance coverage could negatively impact small businesses, an alternative view would be that not having to worry about where they’ll get health insurance could prompt more people to go out and start a business vs. sticking with their regular job due to keep their insurance. Are you frickin serious???????????????? You seriously think obamacare will stimulate entrepreneurship????????????????? Did you actually look at that chart? Don’t make more that a little over $60k or you’re screwed – thanks to obamacare. Way to bring down American entrepreneurship. Seriously! Have ANY of you read any history books?????????????? Socialism/communism does NOT work! Do the frickin math! Who educated (propagandized) you people? I guarantee you there isn’t a single person who supports obamacare who has EVER lived in a socialist/communist country. Educate yourselves and quit being seduced with this b.s. harold – I don’t know. Lack of a subsidy doesn’t make one worse off than before. I get Evan’s point about certain low-cost bare bones policies are off the market now. Some are forced to spend more to buy something better. Anyway, there are plenty of debates about the merits and the dismerits of Obamacare. This is not the right place for that debate. It’s for looking at the lay of the land and seeing what we make of it. The cheapest bronze plan I could find would have cost nearly $7k in premiums, with a $6k deductible. (I’m 58.) So, for that $11k in 2014 Obamacare coverage — if the kidney stone I had in 2012 had happened this year, I would not have gotten one (very!) red dime in insurance coverage! And the $8k that took nearly a year to pay off ONLY covered diagnosis (a night in the ER, tests, drugs); but NOT any treatment! They referred me to a doctor, but I couldn’t possibly pay for anything more. Thankfully the pain drugs allowed me to live through the excruciating couple of weeks of the *#&@&* stone making its way out… and I was fer shure praying for no complications, because that would have bankrupted both me and the company. So yeah, you betcha, Michael — CommieCare REEEEALLY helps this entrepreneur! Thankfully, as it turned out, when I jumped through hoops and pretty much begged, I managed to get admitted into the VA health care system. Seems I “made too much” to be admitted — but since I had served for six years as an officer (back in the 70s-80s), they finally “had” to let me into the system. I can’t actually GET health care from the VA (there are lots of maimed kids and older vets who, rightly, come ahead of me in line for care), but I cling to the hope that if something serious goes wrong, I might be able to get seen… But at least I only have to pay a boatload of taxes for OTHER people’s CommieCare — and not penalties or completely destructive premiums for “my” insurance. Sorry to hear your loss Elenor. Would switching the business to a C Corp help? My understanding is that in addition to the premium subsidy cliffs, there are also cliffs at 150%, 200%, and 250% of FPL with regard to the cost-sharing subsidy. One has to decide how much such a benefit is worth in dollars terms and lifestyle design. May be Harry or you can quantify this. Mike – That’s true. It’s a big topic. We will have to take one small bite at a time. KD – The value of low deductible, low co-pay, and low out-of-pocket maximum of course depends on how much you use the insurance. As you said, when you are older and you need more service, the low cost-sharing becomes more valuable. Hopefully you remain healthy and you make it a non-issue. Otherwise directionally I would say if you can live on much less income than 400% FPL now, convert some money to Roth and push toward it. Save the low income years for the future when you need the low cost-sharing. What are the last minute things that you can do to reduce the MAGI for the purpose of ACA subsidy? Say, it is 12/26/14 and you just estimated that your MAGI is hitting the income cliff. It seems like the place to look at are the “above-the-line” deductions. Are charity donations going to help? Yes, above the line deductions. So, no, charitable contributions will not help. Things like HSA contributions, pre-tax 401(k) contributions, and deductible IRA contributions would help. No, charity donations are below the line. Above-the-line deductions include among other things HSA contributions, self-employment retirement contributions (solo 401k, SEP-IRA), deductible traditional IRA contributions, and tuition and fees. Most of the above-the-line deductions are hard to generate in the last minute if you are not self-employed. One interesting item I see is the penalty for early withdrawal from savings, which I guess would include CDs. Is the income cliff that steep such that paying say $100 in early withdrawal penalty would net you more than $100 increase in subsidy? I think the deductible traditional IRA contribution is a good lever. If someone contributed to Roth because of lower income and lower tax rates, recharacterize to traditional. It’s deductible at that income level. CD early withdrawal penalty is useful only if you are right at the cliff. Low interest rate means low penalty. You’d have to withdraw a lot early in order to generate a meaningful penalty. But if it comes to that, sure. The chart shows if you are $1 over, you lose $4,000 in tax credit (for my age group in my area). If a person has ready cash, I think the person can generate as much penalty as he/she likes — open the CD on day one and break on the next day. You will pay a high penalty if the CD term is long. However, the person needs to check the terms carefully that the institution will not deny a person from breaking a CD within a certain amount of time. Obviously if putting money into the deductible IRA is available, paying a CD penalty is much less favorable. I see conflicting info on “household income”. Can a married couple (one on Medicare and one not) file married/separately and get the exchange customer under the $46000 MAGI level? You cannot receive the premium subsidy credit if you are married filing separately. What are the consequences of under or over estimating your magi when applying? If you under-estimate your income to make it below 100% FPL or 138% FPL in states that expanded Medicaid, you will be denied the premium subsidy advance. Then you will get the subsidy back when you file your taxes. If you under-estimate your income to make it below 400% FPL but your actual income is over 400% FPL, you will have to repay the premium subsidy advance when you file your taxes. If you under-estimate your income but your actual income isn’t over 400% FPL, you will have to repay some, but not necessarily all, of the premium subsidy advance when you file your taxes. If you over-estimate your income to make it above 100% FPL or 138% FPL but your actual income isn’t, you repay some, but not necessarily all, of the premium subsidy advance when you file your taxes. If your over-estimate your income to make it above 400% FPL, you will be denied the premium subsidy advance. Then you will get the subsidy back when you file your taxes. If you over-estimate your income to a point still below 400% FPL, you will get additional premium subsidy when you file your taxes. Nice write-up. It does appear to be a “cliff” due to the fact that the credit was not appropriately phased out gradually at the cutoff level. For some people, I’m thinking this will make the marginal tax rate at the cutoff very, very high. Yes, a very nice write-up that increases the awareness of the importance of income numbers, even $1. Does a “capital loss” from a state’s tax-exempt municipal bond index fund bring down your MAGI? As usual, realized capital loss first offsets realized and distributed capital gains, which reduces gains added to your MAGI. If you have more losses than gains, you can bring down your income by up to $3,000. Any additional losses are carried over to the next year. When you report income for obamacare do you only report when you withdraw from any of your savings like CD`S,Roths, and other investments? You report all your income. Interest earned on your savings is income, whether you withdraw or not. However, withdrawing from your own savings or from Roth accounts (if you meet qualifications) isn’t income. It is my understanding that a 401k (whether employer or individual) is deducted before calculating your ACA credit, but an IRA is not. Can someone clarify that? Not exactly. Traditional 401k contributions are excluded from your income; Roth 401k contributions are not. Deductible contributions to a traditional IRA reduce your MAGI; non-deductible contributions and Roth IRA contributions do not. Thank you for the article. The only intelligent answer on the net to the question of Obamacare MAGI and tax free municipal bond interest. But I am now more depressed. On line I have seen that a 401k contribution is not added back to calculate MAGI but a regular self funded IRA is What is true? ?? Of course what I say is true. There is no adding back for either. Pre-tax 401k is taken out before your W-2 income. Your deductible IRA contribution is an above-the-line deduction, which comes before your AGI is computed. Only add back non-taxable muni bond interest and Social Security benefits. I am in early retirement and on obamacare healthplan. I also have Nuveen tax free muni bond funds that I earn and take the monthly dividends. They are down in value, essentially losing money. I havent sold any though so no loss on capital gains will show. Am I correct that I still have to include the dividend interest but cannot deduct any losses unless I sell? I really dont want to even though at this point I feel the interest dividends are being paid out of my own dollar investment. Can you clarify if I am correct? That’s correct: no deduction for loss until you sell. Also, loss is calculated off your original purchase price, not the highest price recently. Specifically to munis, if you sell for a loss within six months of purchase, the tax-free dividends you received become taxable. Their income has to be above the federal poverty level in order to receive ACA subsidies. They also need to have earned income in order to contribute to a Roth IRA. If they otherwise qualify for both, contributing to a Roth IRA does not reduce or eliminate their ACA subsidies. It’s moot if they can’t do either to begin with. My daughter is 23 and a student this year however her summer job has become a permanent part-time job. i am early retired. Am I right that this year she could make a tax deductible contribution to a traditional IRA instead of her usual Roth contribution in order to lower our family income? I am carrying her as a dependent and deducting her medical expenses(she has type ! diabetes) but her income is higher of course than her typical summer jobs she has had so far. She is on her dads insurance. I would think she still files her own tax return even though she’s claimed as a dependent by you. If that’s the case whether she contributes to traditional or Roth IRA doesn’t affect your income. I’m pretty sure family income is not affected by your daughter’s income, even if she is a dependent, so she should be fine for three more years regardless what she earns. That works too. At a low income level, long-term capital gains are taxed at 0% federal. I figured this strategy out last year when I got laid off and was forced to buy ACA Insurance. Now I pay the same as when I was working with no deductible, basically it’s catastrophic. So now I don’t go to the doctor unless I really have too. Who’s looking out for you? But to me the worst part of the ACA is that my insurance is not deductible I would draw a lot more out of retirement accounts if it was deductible. The ACA is bad for the economy for this very reason. If I started a small business could I write off the family ACA insurance? Self-employed individuals can take advantage of 1040 line 29 — self-employment health insurance deduction. It’s a way to use some of the net earnings from your business to pay for premiums for a health insurance plan if you are not eligible for a workplace plan. My parents own and operate a business that earns $60-70k a year and my mom makes an additional $5-10k a year working odd jobs on the side. The business income puts them out of reach for the health care subsidies. What we are considering is incorporating the business as a C-Corp and paying my dad a small salary of $25k a year. This would put them in reach to qualify for a healthcare plan in our state that would only cost $80 per month. As a tax professional, what I am concerned about is the reasonableness of the salary. The IRS requires shareholders/employees of a Corp to pay themselves reasonable salaries, and I am concerned that $25k on $60-70k of income is not reasonable. What do you think? I was going to say “check with a tax professional” but you are already a tax professional. Is $60-70k already after maximum contribution to a retirement plan such as a Solo 401k? If not, that’s a good way of lowering AGI without getting into a C-Corp with double taxation and salary reasonableness issues. I plan to retire early (and take advantage of ACA subsidies) about the same time my son graduates college. I’m guessing at that time he can no longer be a dependent, but he will probably still need to be on my insurance (under 26 rule). I am looking at ACA costs/subsidies and they are only based on income and number of dependents. If my son is on my ACA plan but is no longer a dependent, is there any change in premium vs. if he is not on my plan? I don’t understand how this works. You son can get coverage on his own, either from work or from the exchange. If you cover an extra person on your policy (a) it may cost you extra in premiums; and (b) you can’t get the premium tax credit. 62 yr old self employed. Does the traditional 401k have to be made in the current tax year or can you still wait until filing taxes April? For the self-employed, traditional 401k contributions come in two parts: the employee contributions up to $18k per year and the employer profit sharing contributions as a percentage of profit. The employee contributions have to be elected in the current year, similar to how it’s done when you are working for someone else (“I choose to contribute ____ from each pay.”). The actual contributions should be made shortly after each pay. The employer profit sharing contributions can be made in the following year before you file your taxes. I am retired at 62 and I am on insurance through the marketplace now. I am thinking of starting a business as an artist which most likely will have little income at first. Two questions: 1) no matter the income as long as I have an income I can add to my IRA, correct? And 2) To calculate for insurance would the amount of income be based on the net business income as self employed? (1) You can’t contribute more than you taxable compensation. For self-employed income that’s your net business profit minus one half of your self-employment tax. (2) It’s based on your “modified adjusted gross income.” Your net business profit is a part of it. It also includes many other items. If your modified adjusted gross income is too low, you won’t qualify for ACA premium tax credit. Great blog! I am 62, still working (on my employers plan) and planning on retiring when I am 65 so Medicare should work ok for me. But my wife is 12 years younger and not working (small income selling on eBay). She will have to go on ACA to get insurance for 12 years. What is our best option? Should she get the ACA insurance on her own and should we file income taxes separately? Or should we continue to file jointly and then I would need to move a big chunk of my 401K to a Roth 401K so that the MRD’s do not put us over the cliff? Of course this latter move would require paying a lot of taxes up front. Filing separately won’t help you. It disqualifies you from receiving a subsidy. You will have to project your income in those 12 years. Social Security counts. Pension counts. Dividend and interest count. Muni interest counts. Withdrawing from traditional 401k or IRA counts. Converting from traditional to Roth also counts. If you are not able to stay off every year, go over big time in one year and stay off in other years. My spouse is retired on medicare and is 7 yrs older. I have retired at 62 and I am on the ACA for my 2 nd yr now. My understanding is Income is calculated based on both of you living in same house regardless of how you file. There is very little that you can deduct for the magi and I was surprised that they counted our tax free muni dividends towards the magi. Your wife having her own business may help some with deductions. Also, one area that is not discussed much but also based on income is assistance with Dr and presciption co pays in addition to premiums depending on income. Interesting that if one underestimates income you have to pay back some of the premium but not the co pay assistance. We too are living off savings rather than investments to help with the cliff but regardless of whether we take or reinvest those lovely munis they count! How about if I convert ALL of my traditional 401K to a Roth 401K before I am 65? Then when I am 65 my MAGI will be under the 400% since withdrawals afterwards from the Roth will not be counted as income. Then I will be entitle to the subsidy. Guess this is called 401K manipulation? It may not be necessary to convert ALL now. That’s why you need to project your income. In order to ensure that income was “in the zone” in say 2015, would it be possible to re-characterize [some exact part of] a Roth IRA conversion in early 2016 (before tax return filed); i.e., instead of trying to nail the calculation prior to Dec 31, 2015 with a conversion of an exact amount from TIRA to Roth IRA? In other words, after Jan 1, 2016 [while doing taxes], I should have precise numbers for all of my 2015 income and not have to do any guessing. Do Roth re-characterizations work like that? Redneck Farmer – Yes it’s possible if you find that you overshot it. Be sure to read the follow-up articles listed at the end of this article, especially the ones on converting to Roth and income bunching. Is the deferred interest on unredeemed series I savings bonds required to be included in the ACA MAGI? So my parents (dad age 62, mom age 53) are retired with a decent sized traditional IRA in Florida. They don’t have any active income, just withdrawals from IRA. So for married filing jointly, they need to withdraw from their IRA at least 100% of federal poverty level for household of 2 right? As shown here http://familiesusa.org/product/federal-poverty-guidelines – $16,020 so they will qualify for maximum ACA subsidy? Or higher than $16,020 for tax year 2016? That’s correct. If they don’t need the money for spending, convert it to Roth, which counts as income. At that income level, they are not going to pay much in taxes anyway. Thank you very much for your response. If they convert $16,020 worth of traditional IRA into ROTH for year 2016, all gains accumulating from ROTH will be tax free right? And second question – my dad has accumulated long term capital losses from past years. So when we talk about $16,020, is it BEFORE or AFTER accounting for the $3,000 annual limit of capital loss carry-forward deduction? Tax free growth in Roth is subject to the usual conditions: 59-1/2, 5 years after first Roth was established etc. It’s after the capital loss. Don’t cut it too close. Even if they convert $23,000 ($20,000 AGI after deducting the $3,000 capital loss), they will still pay zero federal income tax. I am self-employed and have a net operating loss from 2015 and can carry over to 2016 as well. I just received notice that I’m being kicked off of my Grandfathered plan (so much for ‘keeping your plan!’). Healthcare.gov states that self-employed individuals estimate their income from their Schedule C, line 31 (Net Profit/Loss). Being that I have a Net Loss, I fear it will push my family and I to Medicaid, which I don’t believe I will qualify for anyway after going through their lengthy application process. Any advise as to 1. if you think I will be eligible for the subsidy or 2. how it is calculated if there is a net operating loss? Are you expecting a net loss after the carryover in 2016 as well? Is self-employment your only income? If you need to generate income above the minimum to stay in ACA as opposed to Medicaid, you can convert some traditional 401k or IRA to Roth. Well, My husband and I just received the nightmare scenario of our 2015 AGI falling just a few hundred dollars over the 400% per FPL Obama care cliff and therefore, financial stab for full premium payback. We would never have been able to afford the 300% rise in our health care per month had we known but now we’ll have to pay thousands and go off insurance indefinitely. I find it sickening how this so-called affordable health care is a boondoggle for the multi-national insurance companies to have an unlimited rise in their percentages while being partially covered for a few by tax payer government subsidies. Meanwhile, middle class people made poorer by the rise of inflation since the 70ties are struggling to pay their mortgages while trying to figure out how to limit their incomes and sneak around their own invested savings accounts just to be able to pay rising helium balloon medical premiums subsidies intact . It seems to be highly questionable these days for the middle class people in this country to be saving anything at all including their lives. I see varying FPL calculations every site I’m on. Who makes those up? I wouldn’t exactly call the system communism but a highly lucrative form of corporate government bundle ( it’s called fascism ) dangled over us slowly boiling frogs in a cruel for profit punishment otherwise known as American healthcare bailouts for the biggest players. The rules of the game were not fully disclosed to us when we innocently signed up for this so cleverly called ‘affordable care’. Learning a lot… a little late, however…interesting blog discussion. My how we’ve been played! This happened to us last year…. 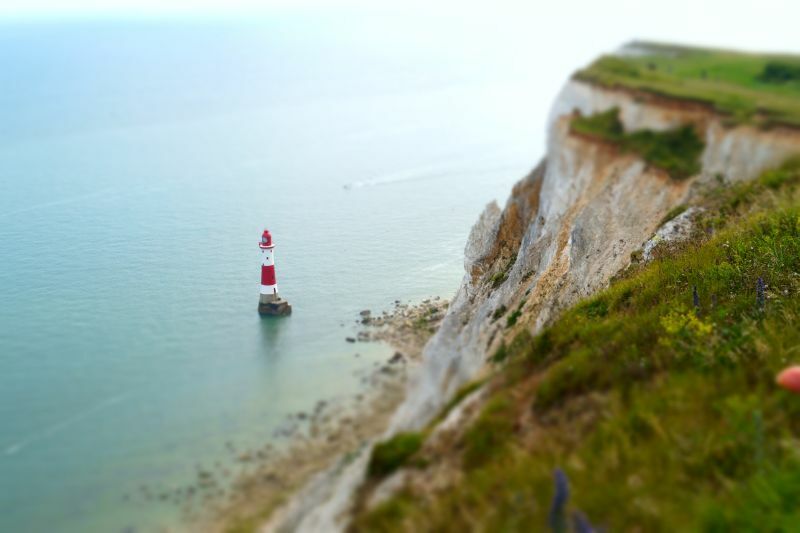 we learned the hard way about the Cliff…. We had to pay every penny back and hit with four $1500 vouchers we had to pay in the year 2016 to make sure we didn’t under pay this year. If we did not pay them it was a 3% penalty added on top. We are in the process of signing up again this year but our income brings us to the 300% mark so hopefully we will be OK in 2017. It was a hard lesson and we did not have the extra money to give the healthcare industry. Obama lied, looking forward to a new administration but still worried about healthcare….. At 62 I may need it. Well, I’m very able to accurately guesstimate my income at the beginning of the year, so I don’t fully understand all of the scenarios that might result in this big income boost at the end of the year from which you suffer, so maybe this doesn’t apply to you. But if you are truly very low-income till the end of the year, then you should be eligible for Medicaid. California is a state that expanded Medicaid. Medicaid counts real-time income, so if you are low-income while receiving it it doesn’t matter if you get a windfall at the end of the year. You don’t have to pay back any of your Medicaid benefit. At the time of the windfall, you would have to shift to an ACA plan (subsidy proportionate to your income). However, my understanding is that the windfall only counts for the month it was received, and then you can go back to Medicaid. Might be worth looking into if you will be in this situation again in the coming year. Here in PA for folks under age 64, assets/resources/savings are not considered in determining Medicaid eligibility. It is only based on income. If you don’t fit in this Medicaid-eligible category because your income is too high, you might want to consider signing up for an HSA plan. If you and your spouse both make the maximum HSA contribution ($3350 or $4350 each depending on age) that can be deducted from your income as well as any traditional IRA/401K contribution. Note that if your income is so low that you qualify not only for a subsidy but also for cost-sharing, then you can’t make an HSA contribution even if you have an HSA-qualified plan. Thanks for the reply…I am wondering how many people found out about this the hard way and i tend to think it is not all that constitutional. There was no disclosure about the ‘Cliff’ when I signed us up thinking that signing up online was A-OK. It is a hidden tax for the middle class…just barely middle class… to pay for the poor. My husband is not taking it very well emotionally. I do not know what the 1500 voucher you speak of is…but an insurance agent told me that if you have an IRA account that can be written off your gross income and bring down the amount to be taxed by Obamacare. I would love to boycott the exchange at this point but they have made that impossible since all premiums have tripled in rates here in CA. Health insurance is no longer affordable for our income bracket. I would join a class action suit if there is one out there to sue the government and/or insurance companies but ‘fascistic’ conglomerates such as this healthcare scam package between private and public agencies makes for a never ending battle. I will be writing letters out to various points of influence, however voicing my complaint. If you are employed or even your spouse, you can add the maximum to an IRA and that totally changes your income for the ACA calculation. I am 63 and retired. I own tax free muni bonds but the dividend/interest must be calculated and added to my income even though they are tax free. Regardless of whether you are losing money because they are down. I ended up selling just so I can take a loss on my income calculation. Capital gains or loss effect your calculations. However, without the ACA I would not have been able to retire. More upside to ACA with required coverage and tests then downside for me. Waiting for the day when I can get on Medicare but now hearing rumors about Republicans making changes there. Thank you for your comment…I am glad to find out about the IRA idea to adjust income as applicable to ACA. I don’t see how ACA is making it better for your retirement. We had fine insurance that we could afford before the law came into effect. Afterwards it shot directly up…from 230 a month to 980.00. Now insurance is no longer affordable unless one has the subsidy. The medical insurance companies all must have gotten together to adjust their rates at the consumers’ expense. I am also very surprised at the lack of disclosure to the public about the 400% over FPL cliff. We had no way of knowing what our income would be until end of year which put us into a vulnerable category. Obviously the designers knew that a certain segment of the population would fall into this predicament and I would even go so far as to say that the industry-government-IRS were gleefully counting on these exorbitant paybacks to recoup their losses. Helps me to better understand why the government supports dictatorships like Saudi Arabia, Turkey and Israel. Is this why you are worrying about whether the new regime will end Medicare and social security? Well, I wonder…How far we will be forced to let them carry out their privatization schemes with the tax payers money. The ACA plans also insure much needed regulation of no denial for pre-existing illnesses, free mammograms and cancer screenings. In addition when you actually start to use many of the plans they have a co-pay and the deductible doesn’t even come into play for most testing. Keep in mind if one has several imaging tests at the same time only one co pay is required which was huge for me. One of my biggest peeves is the fact that medicare is not allowed to negotiate drug prices as the Veteran Assoc. can. Why? Wonder how many insurance companies own or have major interest in the drug companies?! Over all I am grateful the ACA passed and that I have it. My husband and I will be about 10K over the 400% line this year due to one time income pop. We do not make enough to contribute that much to a deductible IRA. Our income is usually very near the bottom, close to being too poor for a subsidy (No medicaid expansion) Is there some way to spread out the income? Or bring our MAGI down ? Thanks. Got cut off, sorry. We do have more than 10K in Roths, could we convert that to a deductible IRA without having that much earned income? We already take the HSA deduction. and some self employment health insurance deduction. Otherwise that 10K is going to cost us $24K in premiums. If you are eligible, you can contribute as much you have in earned income up to $5,500 per person per year ($6,500 if you are 50 or over). If that’s still not enough to bring your MAGI down below the 400% cutoff, you will have to see if you can reduce your one-time income pop. What’s giving you that pop? Perhaps you can open an HSA. It will lower your magi. Most ACA plans qualify. Funds do not expire but must be used for medical expenses. You can open and fund one for 2017 until April if 2018. I will use my funds for RX once I am on medicare in 2 years. We already take the Max HSA so that’s baked in. I’m wondering now if we could move some money from our Roths to a Deductible IRA and take that deduction Above the Line. Can you move more from the Roth into a Regular than you make in a year? Do you have to have done a more normal “conversion” (regular to Roth) previously? Other restrictions? In order to qualify for premium subsidy for buying insurance from the exchange, you must have income above 100% FPL. In states that expanded Medicaid to 138% FPL, you must also not qualify for Medicaid, which means you must have MAGI above 138% FPL. Q. Why is going on Medicaid not beneficial? Some doctors don’t accept Medicaid. If you are happy with Medicaid, no problem. Hi Harry – what is the income range (for 2017 tax return) that a COUPLE (married filing jointly with no dependents) needs in order to get the max Obamacare subsidiary? Just above 100% FPL in states that didn’t expand Medicaid, just above 138% FPL in states that did. See 2016 2017 2018 Federal Poverty Levels (FPL) For Affordable Care Act. According to my understanding, it still is any dollar over 400% above the National Poverty line figure which is different state to state and year to year. You can find out exact figures on the IRS website…the covered Ca people seem to be instructed not to tell you so that you may get a big surprise like we did in 2016. I found out from the IRS website. This cliff is the crucial edge where one must pay all subsidies back. ACA does wonders for the middle class…NOT! Only an IRA account investment will allow you to subtract from your gross income in order to bring this income amount down so that you are not over the edge. Thank you for your really helpful article! I have been unemployed/under employed for all of 2017, earning a grand total of $18,208 for the year. In addition to that, I received $5,395 in ACA subsidies for 2017 (per my 1095A form). I also decided to roll my 401k IRA over into a Roth IRA in 2017 because I saw that I’d be in the lowest tax bracket and wanted the taxes due to be as low as possible. That rollover amount was $28,244. After the rollover, I took and early disbursement ( I am only 54) in the amount of $17,930. In preparing my own taxes for 2017, the rollover amount of $28,244 is showing as income and incorrectly inflating my AGI, which is triggering a total repayment of all of the ACA subsidy. Per your article, my MAGI number is based on $47,520 ($11,880 x 400%), right? And currently, the 1040 form that I’m working on shows my AGI as $46,472. What do recommend I do, so that I am able to keep my ACA subsidy (because I truly had a low income year) and also properly include the rollover amount (which is taxable because it went from a tax deferred IRA to a taxable Roth IRA)? Any help you can offer would be much appreciated! It’s possible that you had premiums less than what is needed for the subsidy. This is common in low cost states and for younger premium. Your income is based on the $48,000 or so, because conversions count as income. I would certainly hope that the rollover would not count towards the ACA calculations! Definitely worth it to pay a tax accountant on this one. Are you eligible to open a health savings account before April 15? That may lower your income and funds are used for future medical. I earn tax exempt i terest on muni bonds but also pay an advisor fees on that account. I am trying to see if that can offset my income because I am on ACA also. Do I have to include IRA or IRA CD interest earned for the year but not taken out of my accounts in my calculation of income? For a MAGI estimate it says to include non-taxable Social Security which I understand what that is but then it says to include “tax-exempt interest” which is what? What does “tax-exempt interest” include. Also if I have the insurance but find that my income on my taxes in that year have gone under the MAGI amount required what happens. Thank you! No, your interest earned in your Ira and not taken out is exempt. Doesn’t count. What they are referring to are generally tax free municipal bonds. This would be in investment accounts but not in IRAs or 401 k. You earn interest and are paid that interest, usually on a monthly basis. The income is tax free but for some reason the ACA says it must be included in your income calculation for qualifying for ACA healthcare subsidy however you do not pay federal income tax on the interest. Wow, thank you for your answer. Do you happen to know what happens if my taxes turn out to be under the MAGI threshold (I think it is around 12,000) and I am already in the Marketplace for the year. Do I just get dropped off the Marketplace, do I have some sort of penalty or payback? Can’t seem to find that info. Thank you! Upon further research it looks like I would be dropped from the Marketplace but not have to pay anything further, no penalty, etc. But also I could not get any refund on my premiums if I overestimated my income. Where as if my income was still over the minimum but not to the higher level of the MAGI I estimated I may be able to file a form for a refund. I don’t think this will be an issue for me but sometimes you can have losses on your taxes you don’t expect… Thank you! I think as I do my taxes this year I may have underestimated my income. Oh well, guess I will have to either repay the diff or get back less depending on the amount. Fyi. Any losses on investments are minused on income calculation for ACA! I fell off the cliff HARD in 2014.. I had to repay $10,000 in advance premium credits. I took too much money from my IRA to pay medical bills and health insurance premiums. Now I pay attention to the small cliff @ 300% and the HUGE one @ 400%. If I had only delayed paying some of those medical bills a few months till I got into 2015 I could have saved close to $6,000. Now I wish they would stabilize things so a person can plan ahead instead of stumble from one year to the next with this healthcare stuff. Unfortunately I believe it will. The only income I believe that doesn’t count is SSI and veterans disability. Even your tax free income counts. You can go to healthcare.gov site and it will tell you what income is reportable. I also think you must be disabled for 2 full years before you are eligible for medicare. If I open a health saving account, will it reduce my income for market place insurance? Is there a time line when you can open the account? Does the market place use income after deductions? Yes! You can open a HSA but it will only help if the health plan you are on qualifies. Many on the ACH do not. You have until April 15 th to set up account the previous yr taxes. It reduces your income and you may use the funds at anytime in the future but not for premiums. Other than this and any capital losses you may are the only deductions tgey allow. Can you use your HSA funds in a year where you do not have a HSA plan? Example: If you open an HSA in 2018 you may fund it and you do not have to use the funds in 2018. In 2019 you may fund the account and again do not have to use any if the funds. At some point you will obviously wish to as they must be used for health care expenses. There are all kinds of banks and financial companies that you can open an HSA with. I would have liked to have opened and funded and then used the account years later when I would be on medicare D drug plan but unfortunately my ACA plan did not qualify. The healthcare.gov site with all the plans disclose what plans are eligible. Wondering if anyone else in my situation? I am currently receiving widows benefits and medicaid. I am going to have to replace the roof on my home and the only way is to withdraw funds from retirement account. This is going to make my income to high for medicaid and will not be able to afford purchase on the exchange so I am stuck and don’t know which way to go. How long before I can reapply for medicaid? I hate to take out a loan and pay more in interest than I am earning on my retirement account. Personally, I would do the loan. Not qualifying for both ACA and Medicaid will be quite costly. You can always pay off that loan in the future. The only other options might be accessing a Roth which is not taxable. I know if you work and your health insurance is more than 9.5% of your income you can apply for Obama Care- does that include prescription, dental, and vision along with the health insurance premium you pay? And that does not include if you put your child on the policy, correct? Is there any cheap premium insurance you can recommend for a young adult under 20. Laura, you can actually go to http://www.healthcare.gov and enter enough information to get a look at actual costs and policies. You dont need to actally apply or give personal info. Just generic. I was on the ACA with BCBS which included RX but not dental or vision. They may have HMO’s that might offer different things. Personally I want more control over who I see and I travel so HMO not a fit. You are young and healthy though. In order to receive the premium tax credit in 2019, you have to show the employee’s premium for the lowest self-only coverage exceeds 9.86% of your household income (up from 9.56% in 2018). That does not include premiums for dental or vision, or any deductible or co-pay. I have tax exempt muni bond interest that must be calculated and added into the magi for ACA. Is there anyway to offset this income by selling stock and taking a capital loss? I recieve monthly income from these tax free bonds however the muni funds themselves would be at a loss if I sold. Would that offset the tax free income received? I am over about $5000 in my income estimate for 2018 and am afraid I will have to pay back funds plus penalty. Not exactly but it can have a similar effect. The loss can only lower your normal income, not your tax free income. Assuming you don’t already have a loss carried forward from previous years, the loss you realize now will first offset any realized or distributed capital gains this year. Then you can use any additional loss to offset ordinary income, up to $3,000. Offsetting your capital capital gains and/or ordinary income will lower your AGI. Then you add your muni interest income on top. If you don’t have any capital gains, generating a loss only lowers your income by $3,000. You still need to find another $2,000 elsewhere. Ok. Let me try this idea/question. I have yrly income of approx $7500 from the muni bond tax free. I have not sold them but I have an “unrealized ” loss on them of about $9000. It seems I have been paying myself that monthly income out of my darn principal and now it may also cost me more $ for ACA. We have purposely complimented our social security income from our savings rather than investments for this reason. Fortunately as of August we are both on medicare! No more aca! Though i was grateful we had that option. Thanks for all your help and quick response! When you already have $3,000 or more in capital loss carried over from previous years and you don’t have any capital gains to offset, realizing additional capital loss doesn’t lower your AGI any further. The additional capital loss will be carried forward to future years. Capital loss from muni bonds does not offset the interest from muni bonds. I’m 28 and my 2019 income will be more than $150k (filing as individual). I’m healthy overall so would it be best to simply skip out the ACA plans since I won’t get a subsidy and go with a short-term plan that covers medical emergencies? You should first find out how much a policy costs. In my area, for one person age 28, the least expensive ACA policy without any subsidy is only $170/month. To a self-employed, it’s also tax deductible. It’s easily affordable with a $150k income. So in my area cheapest ACA is $226/mo with $8k deductible. I’m looking at short-term health insurance plans and I get one for 12 months for $135 with $5k deductible & max out of pocket and 0% coinsurance. ACA plans are better. They can’t deny claims as pre-existing conditions. They also don’t have any coverage maximum. I agree with Harry 100%. I will tell you what my insurance agent said. Say you get a short term policy for a year and you develop cancer during that year. When that year is up, that insurance company or another might write you a new policy, but cancer will be a pre-existing condition and won’t be covered for one penny. If you are still undergoing treatment or it comes back, you’re screwed. Get an ACA plan and sleep well. And don’t think 28-year-olds can’t get cancer. Well what was your combined income? Your spouse should be eligible for Medicare at 65 (younger if on disability or has End Stage Renal Disease), you may be confusing this with Social Security when you mentioned 66. No comment on the rest of your question, it seems more details may be needed. Good Luck! This is a great thread & a really important topic. I retired in my early 50’s and have been buying insurance on ACA since it was implemented. As a consequence of ZIRP implemented by the Fed post-financial crisis my fixed income investments have been yielding very little but the flip side of that has been to allow me to dial in my MAGI (basically Roth conversions, interest, dividends & capital gains) to maximize my subsidy and minimize the cost of insurance. For 2019 my net cost for a Silver Plan for a family of three is about $550/mo based on $67k MAGI which is reasonable IMO. The messed up thing is the whole 400% MAGI cliff whereby a small increase to around $82K would send my premiums through the roof to over $2100/mo. Whatever the rules are I need to play the game for another 7 years before Medicare, but I still remain stunned that they created a system so patently unfair to so many people. Why was the cliff necessary to create this law? It should be a smooth phase-out as MAGI increases IMO. I dont mean to be political but I believe if the Democrats get elected in 2020 you will see changes that may be in your favor of your healthcare situation. You may see some positive changes sooner as the mid term election showed healthcare is a major issue for many Americans. I am now on medicare and so grateful to not be worried any longer though it still costs my husband and I almost $700 a month for medicare and supplemental premiums. When I was on ACA it drove me crazy that my dividends on my tax free muni bonds were not counted towards my own income but were counted towards my magi. Holding those investments caused my magi to increase even though they were down many thousands of $. I did not want to take that kind of hit and sell at a loss. Might a healthcare savings plan help offset your magi? Great column, I have learned alot. To make sure I am straight on this. I recently quit my job and may not meet the minimum threshold for 2019. I can just transfer traditional IRA to a Roth Ira and that could help me get Obamacare subsidies? Would taking a 20k capital gain on a second home sale, also qualify me? Yes converting to Roth will raise your income. At very low income levels it’s probably also tax free. Realizing capital gains will also raise your income. It’s also tax free below a certain threshold. My filing status is single, and my agi is above 138% of FPL to qulify for silver plan in 2018. As for 2018 tax return, I’m considering to claim my mother as my dependant, this will change my filing status to head of houshold, and household size changed from 1 to 2. I forgot about the obamacare, silver plan eligibility at all. The 138% FPL (or 100% FPL in some states) minimum income is only looked at the time of enrollment, not at the time when you file your tax return. If your income for the year ended up below the minimum, as long as you made the original estimate in good faith, you are not required to pay back the premium subsidy you already received. You are required to notify the marketplace when your income and household size change. If your income going forward will be below the minimum for ACA based on your household size, they will switch you to Medicaid.